At the 1,000 kilometre race at the international Le Mans cup in Zhuhai China, the Porsche 911 GT3 R Hybrid has impressed every one with its performance and efficiency. 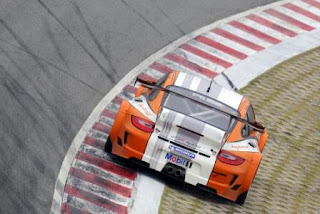 The innovative sports car from Weissach, piloted by Porsche works drivers Joerg Bergmeister (Germany) and Patrick Long (USA), was by far the fastest GT vehicle in the field at its eagerly awaited premiere in Asia. On the 4.319 kilometre Zhuhai International Circuit, the 911 GT3 R Hybrid, which started in the special GTH class, was not only the fastest but also the most economical GT vehicle. Thanks to its Flywheel based KERS systems, it made one less pit stop and completed three more laps than the next GT opponent. “The first race in China with the 911 GT3 R Hybrid was a complete success,” says Hartmut Kristen, Porsche Head of Motorsport. “The car contested the entire race without the slightest technical problem. The excellent pit stops by our factory squad from Weissach and an absolutely perfect performance from the drivers also contributed to this success.